Today I'm making an asparagus quiche for dinner. I often hear people debating whether to make or buy their pie dough. Let's get one thing out of the way right off the bat with this post. You don't have to be an expert to make pie crust. 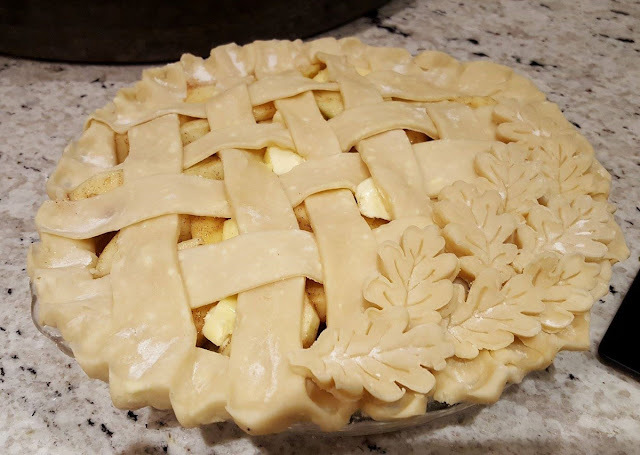 I know from talking with friends, family, and co-workers year after year, that making pie crust fills more people than not with dread and fear. The same used to be true with me. Making pie dough is not rocket science. A simple combination of flour, fat, salt, sugar, and water magically comes together to create the foundation for a delectable filling. What's so hard about that? Well, it seems that far too many of us overwork our dough. Too much handling of the dough makes it tough. Others of us add either too much water or too little water. Still others of us don't keep our ingredients chilled. Wow, there sure is a lot we can do wrong with so few ingredients! Enter the food processor. Before using the food processor, I cut the shortening and butter into my flour mixture with a pastry cutter. Do you have one of these? I know, the pastry cutter itself is enough reason to run screaming from the kitchen! Luckily, I discovered the food processor for making pie dough and with it, fear gave way to confidence. I still have this pastry cutter, but it has been relegated to a box with seldom used kitchen tools in the back of a kitchen cabinet. Simple, right? Let's make some pie crust! Mix (pulse) the flour, sugar, and salt in the bowl of your food processor. Cut the cold butter and shortening into small chunks and add them to the flour mixture. Pulse about seven or eight times, until the butter and shortening are well distributed and in small pieces. Continue to pulse, adding 1/3 cup of the ice water. The dough will begin to clump together. If still too dry, add more ice water one teaspoon at a time. Once the mixture holds together you are done. Turn the dough out onto plastic wrap. Divide the dough into two pieces. Don't handle the dough too much or you'll be sorry. Flatten the dough into disks. Wrap each disk in plastic wrap and refrigerate them to chill for at least 30 minutes before using. When ready to roll out your dough, begin by generously flouring your workspace, using at least 1/4 cup of flour. Unwrap your disk of dough and place it onto the flour. Turn the dough over being sure both sides of the dough are floured. Rub flour onto your rolling pin and begin rolling away from you and turning the dough clockwise, after every few rolls of the pin. Keep rolling until your dough is about an inch larger than your pie plate. Fold the dough in half and lift it over the pie plate. Fit the dough into position in the pie plate and crimp the edges. If making a single crust pie, refrigerate the dough for 30 minutes before filling or prebaking. If making a double crust pie, roll out the top crust, fill the bottom crust, cover the pie with the top crust and chill for 30 minutes. Bake according to your recipe directions. 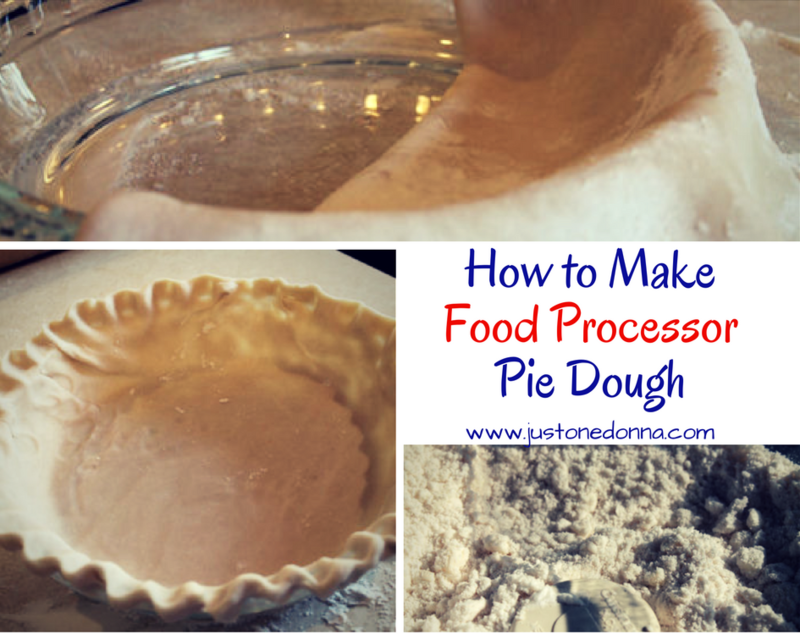 If you own a food processor go ahead and use it to make your pie dough. It helps take the fear away and the debate you have with yourself about whether to buy or make yourself will be over. No need to buy pie dough again. Here's my recipe for Asparagus Quiche.